To really showcase the Shift X and its capabilities, we decided to water cool the Strix 1070 using a great looking Phantkes water block. The i5-7600K was cooled using the Phanteks CPU water block. The RGB cables on the water blocks can either be connected to the motherboard or the built in RGB controller on the Shift X or other Phanteks cases that have the RGB controller built in. As I started working on the build, I realized that it would have been easier if I would have removed the top exhaust fan to allow for some more room for my hands to route cables. The picture above is a great example of why the case comes with an 8 pin CPU power cable extension. I ended up using a Phanteks sleeved cable extension for my build. Depending on the PSU being used and the motherboard, you might have to get a 24pin motherboard extension cable as well. Build Tip – Plan your cable routing before you start dropping the hardware in the case. CPU power can be routed from the front of the case with the help of an extension. Installing the GPU is pretty easy, and having a reinforced PCIe cable gave me the confidence in making tight turns to allow the GPU to be positioned how I wanted. Build Tip – Don’t tighten the GPU support bracket right away. This will allow you to position your GPU according to your loop setup. An SFX power supply sits perfectly in the case. There is support for ATX power supplies, but I would recommend that you use an SFX one so you can use the front of the case for mounting your water cooling gear and still use the PSU shroud. Build Tip – If you are not going to be running a custom loop, you can run an ATX power supply without any issues. Even though there is a lot of space, the case truly shines the best when used with an SFX power supply. Make sure that your PSU cables are long enough to reach the components as needed. Built Tip – If using a 120mm fan, the mounts in the bottom allow you to move and place the fan in many different positions. It’s very easy to install a 120mm radiator in the bottom. Having the ability to remove all the panels easily allows you to work in this small case without fighting any cramped corners. The only place where I felt I could use some help was on the top right mother side, but removing the front fan solves that problem. Build Tip – Remove the top SSD cover and the front fan to allow for more working space in the case and route cables without wanting to sound like a sailor. And there it is, the finished product. I wanted to have more cooling for the GPU and the CPU then what a single 280mm radiator can provide. I oped to use a slim 240mm radiator instead, and mounted a 120mm radiator in the bottom. Having the ability to remove the top SSD cover allows for the tubes and the fittings to not have any clearance issues. Build Tip – The case design allows for tubes to be only routed on the motherboard side. There isn’t much clearance on the GPU side for fittings or the tubes to come out the GPU block. The built in RGB controller is perfect for controlling some LED strips. I used the Phanteks LED strips, and the fact that they plug right into the Shift’s RGB controller allows for great control. Once I mounted the glass panels back on, I realized that adding some more light would be very beneficial. This is where I used some standard LED strips cut to length to make sure that I get light in all the right places. Build Tip – You can easily solder on standard LED strips to use with the RGB controller built into the case. You might want to think about adding some light in the bottom of the case to showcase your water cooling setup as well. Let’s see what the GPU side looks like. Having the ability to mount the GPU facing the window allows you to showcase the water block in all it’s glory without any issues. Having a dark block inside a dark case might require you to get creative with the lights to showcase it better. 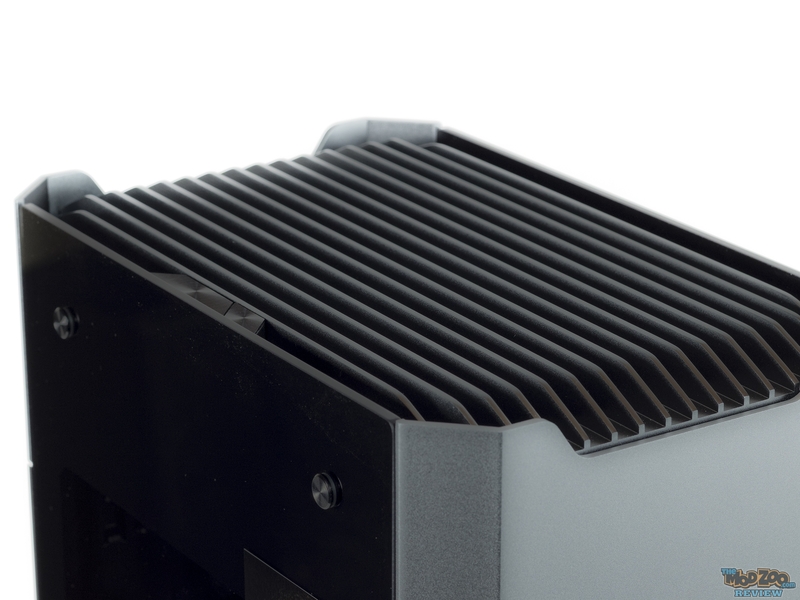 Build Tip – The GPU mounting bracket can also be used to mount some LEDs in it. For my build I mounted some LEDs in there to direct some light on the water block. With the glass panels on, the case looks really elegant and nothing shorter than a work of art. No matter what angle you look at it from, the Shift X is a stunning case. Fittings – Primochill Ghost white with 1/2″ PETG tubing. Res/Pump top combo – EK DDC res combo.